This past Saturday December 11th, Microsoft and ObjectSharp hosted AzureFest, a community event to raise interest and learn a little bit about Microsoft’s cloud platform, Windows Azure. My colleague Cory Fowler gave an introductory run down on the Azure platform and pricing, and then demonstrated for those in attendance how to go about Creating an Account and Deploying an Azure Application. The best part, is that our good friends at Microsoft Canada offered $25 in User Group Funding for each person in attendance that followed along on their laptop to activate an azure account and deploy the sample application. The even better part, is that MS Canada is extending the offer until December 31st online for anybody that goes through this process to activate and deploy a sample application online. We’ve got the instructions for you here and it will take you approximately 15 minutes to go through the videos and deploy the sample. 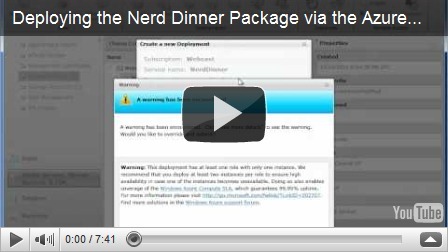 Download the application package that you’ll need for the deployment here. a Valid Credit Card (don’t worry, in step 4 we’ll show you how to shut down your instance before you get charged). Specify TVBug, Metro Toronto .NET UG, CTTDNUG, Architecture UG, East of Toronto .NET UG, Markham .NET UG, etc. 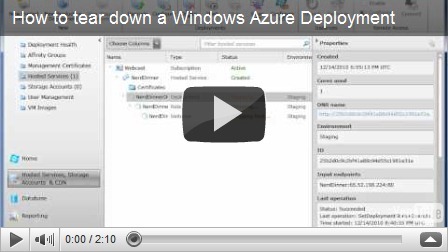 I have an MSDN Ultimate Subscription to give away to the winner of this challenge! The winner will have successfully built a showcase TFS Client for Windows Phone 7. I will accept entries until November 30th. Would love to see the status of a given build type, the latest build, success/fail, the offending people who checked in code on a broken build. Would be nice to kick off a QA or Production build (or any type for that matter) from my phone once I’ve got the all clear from QA. What’s the status of the current build? What exit items are still open? What’s our current velocity? What’s the burn down look like? Would love to edit a work item, reassign it to somebody else, close it, reactivate it, etc. Log a bug perhaps? Being able to look up a work item owner, or build breaker in my address book and phone or email them seems obvious. Let me know if you are planning on entering. I’d be excited to provide some coaching and guidance along the way. I’m sure you will also win a free date with a MS Developer Evangelist and be featured on the CDN Dev Blog. I’m pretty sure you aren’t allowed to win if you live in Quebec or work for Microsoft or the Chinese government, but please don’t let that stop you from submitting an entry! Gentlecoders, start your engines! Best of luck. This is just a quick follow up post from my demo at the Toronto Code Camp last weekend. Thanks for everybody who came out. View more presentations from bgervin. The .NET Pet Shop that I used as a sample is available for download. Blogs: Cameron Skinner, Peter Provost and last but not least Chris Lovett who has some most awesome video demos and tips for dealing with large diagrams. He also provides some samples for those that are interested in learning more about Directed Graph Markup Language for creating their own diagram generators. The Patterns and Practices Team has released a set of templated layered diagrams for various references architectures. 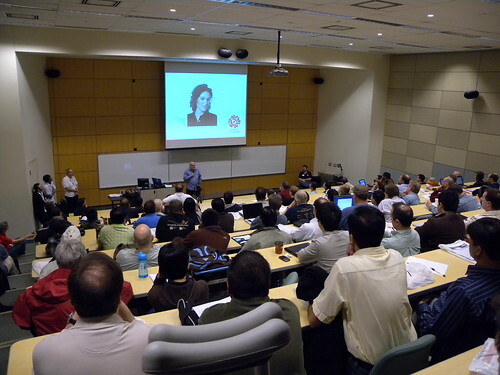 I had the privilege to open up the 2010 Toronto Code Camp last week. It’s hard to know what to talk about to such a broad audience getting ready to kick off a great event with so many different sessions and tracks. A topic that is near and dear to my heart is about trying to figure out what makes software relevant. Ultimately it is about knowing your customer, very intimately so you can build the best experience for them. With that said, I decided to step outside the world of software development to compare to successful invention/design stories and how they differed in their approach to “knowing their customer”. Ron Popeil the famous pitchman and inventor of the Infomercial. Malcom Gladwell wrote an interesting article/biography Ron and his fellow pitchman. There is a lot to learn about Ron’s successes, but specifically how he focused on the audience that he knew. Himself. The chef, the entertainer, and the balding guy. The contrasting story of Deborah Adler and her thesis turned Target product for a revolutionary redesign of the common pill bottle, is no less inspiring. You can watch/hear Deborah tell her own story from the Mix 09 keynote. Unlike Popeil, Deborah inspires her design efforts by forming such an intimate understanding of her customers that she refers to it as a “Love Affair”. These two approaches are so simple and common sense that it’s hard to ignore them when compared to the way most of us build software and disconnect ourselves from our users through layers of requirement and specification documents. The rest of the conference was a tremendous pleasure and wouldn’t have been possible without the efforts of the numerous volunteers, speakers and most importantly Chris Dufour who has the thankless job of herding this motley crew of geeks :) Thanks to all who made a contribution to this worthwhile event. This is just a quick follow up post from my demo at Visual Studio 2010 At The Movies last week. Thanks for everybody who came out, especially those from out of town. The current VSTS 2008 Test Edition can load test up to the limit of your machine. On a good day, this is 1000 users. That satisfies a lot of the cases where people need to do load testing. If it’s not, and you have multiple testers, you always all run load from your own machines, however you don’t get the same unified collection of statistics – that’s what the Load Agent & Controller software is for. It’s not a huge deal, and that is why most people don’t buy Load Agents. If you did need centralized collection of statistics, you’d want to buy a number of load agents, one for each CPU, at least in the 2008 SKU. If you wanted to test 10K users, you’d probably want 10 licenses (at least). But that is changing. In 2010, load testing licensing is no longer done by the CPU, it’s done by the virtual users! When you upgrade to VS 2010 Ultimate come April, your load testing ability changes to only 250 users from your workstation copy of Visual Studio 2010 Ultimate. If you want to test more, you’ll want load agents. 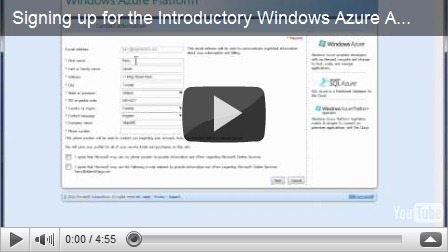 The 2010 Load Agent SKU will give you 1000 virtual users. If your hardware is not up to snuff, or your web tests are intensive, you can install a single 2010 SKU on any number boxes, but you’re limited to a total of 1000 users per SKU that you purchase. If you have purchased a 2008 Load Agent with Software Assurance, as part of the upgrade to 2010, they will give you 5x1000 Virtual Users in the 2010 Load Agent SKU. Wow! For your benefit of pricing, that means if you buy a 2008 Load Agent with SA today, for about $8,000 you will get 5000 users in 2010. That’s a very good deal. If you wait until after April 12th, you will no longer be able to buy the 2008 SKU and you’ll have to buy the 2010 SKU. At about $8,000 per 1000 users. So if you wanted to test 5000 users come April 12th and you didn’t take advantage to get in on this deal, it will cost you 5x$8000 = $40,000! I’d say that an 80% discount is pretty good – snap it up today. If you need help purchasing a license prior to April 12th, drop me a note at bgervin @ objectsharp.com and I can hook you up. DevTeach Montreal is less than a month away but it’s not too late to register. This is a great conference with sessions covering .NET FX, Future, SQL Server, VSTS/Team System, Silverlight, Agile Development, Software Architecture, ASP.NET. Aside from the great content, build up your professional network by rubbing shoulders with the speakers in an intimate conference. The list of speakers is particularly impressive this year. From MS you’ll get to see Elisa Flasko and Carl Perry from the Data Programmability Team, Beth Massi and Yair Alan Griver. Of course .NET Rockers Carl Franklin & Richard Campbell will also be there with fellow MS Regional Directors Tim Huckaby, Joel Semeniuk, Stephen Forte, Jim Duffy, Guy Barrette and yours truly. But wait, there’s more. Each attendee will get Visual Studio 2008 Pro and Expression Web 2.0 full copies along with the entire DVD set covering all sessions from TechEd 2008 Developers conference from Orlando this year. It’s Shamwow! If you attended TechDays, your included coupon is now worth $350 off the price of DevTeach. If you didn’t, you can use this code:TO000OBJSHARP good for 50$ off. Sign up here.